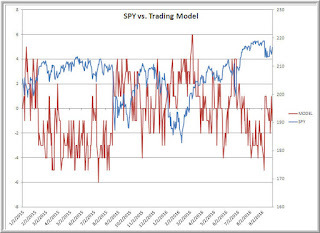 Above we can see SPY (blue line) plotted against a six-variable trading model that I developed using ensemble modeling. When we have a positive score, the model is deemed to be bullish over a next 10-day horizon. When we have a negative score, the model is deemed to be bearish. The model is flat as of yesterday's close. The model includes such variables as market volatility, breadth, buying/selling participation, and market cycle status. 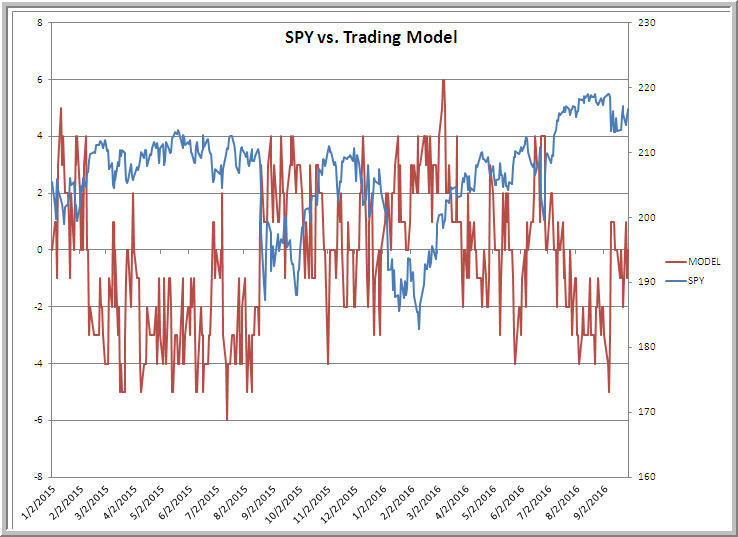 When the model has been at a score of +2 or higher, the next 10 days in SPY have averaged a gain of +2.08%. When the model has been at a score of -3 or lower, the next 10 days in SPY have averaged a loss of -.83%. Between scores of +1 and -2, the next 10 days in SPY have averaged a small loss of -.08%. 1) Out of the 573 days of my in-sample and out-of-sample periods, nearly half are scores less than +2 and greater than -3: in other words, days with essentially no edge 10 days out. That doesn't mean sources of edge can't be found on different time frames with different models, but this finding is important. Even with a solidly researched source of edge, there are plenty of occasions when not trading is the best trade. 2) The model signals have been good, but even with their edge, there is plenty of noise. Note, for example, that the model was bearish during much of mid-2015, when prices chopped around quite a bit. We were also bullish during fall, 2015 during a volatile bottoming period. A trader could have an edge with a model but be unable to survive the noise around signal, especially if sized quite large. 3) I suspect the model works because it's exploiting cyclical behavior in markets at a time frame that is too long for active traders and too short for true investors. A key to trading the model, as we've seen, is not placing trades when there is no clear signal. There have been no solid signals from the model in the last 14 trading sessions; such periods are not rare. It's the selectivity of the model that might be its greatest advantage. 4) Such models don't have to be traded mechanically. For instance, a short-term trader could use the model to decide when to trade with a directional bias and when to take short-term setups without such bias. More fundamentally grounded traders could use models such as these to help with the execution of longer-term positions. Good models provide good information; that information can be useful in discretionary decision making. The act of developing models itself gives one a feel for markets. The model inputs are there for a reason: the model simply captures when those reasons line up. It is interesting that the most rational of analyses can feed the deepest intuitions.